The KJV Bible says that the Spirit helps us in our infirmities when we don't know what to pray for. The NIV Bibles says that the Spirit helps us in our weakness. 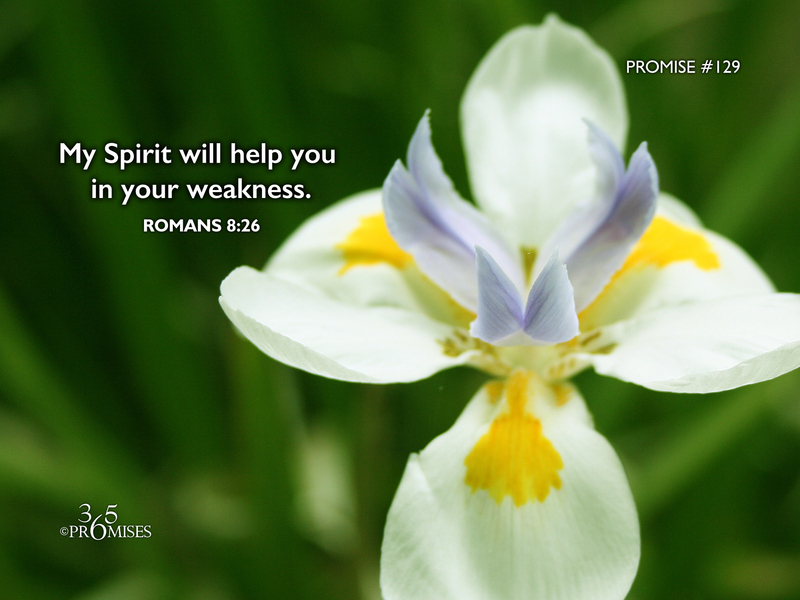 Today's promise brings good news to everyone who has every felt weak and uncertain of what to pray for. I find it very comforting to know that the Holy Spirit that lives inside of me, is ready, willing and able to help me in my greatest moments of weakness. But what about the times when I feel strong? What is the role of the Spirit of the living God when I am walking in my own strength? Is He helping me then or is He just waiting for me to be reminded once again that apart from Jesus I can do nothing? (John 15:5) I believe that one of the greatest principles of the kingdom is the principle of weakness. As the Apostle Paul discovered in 2 Corinthians 12:1-10, when he was weak, then he was strong because God's grace was made perfect in his weakness. If you are feeling weak today, be encouraged! The Spirit of the living God that lives in you will help you in your greatest times of weakness and will even pray through you the words that need to be spoken to the Father when you don't have the words to pray. May each one of us receive a deeper revelation of the glorious Kingdom principle of weakness today.